This lifeline, however, has seen a historical progression of inequity among race (and often class) lines. Transportation can serve as a barrier to opportunity causing people to become “transportation disadvantaged,” due to factors including car inaccessibility, low income, disability, language barriers, and long-term obligations such as work, school, or medical needs. There are a myriad of historical events, beginning just after the Civil War Reconstruction, up to the present, which demonstrate how transit, race, and equity of opportunity are linked. 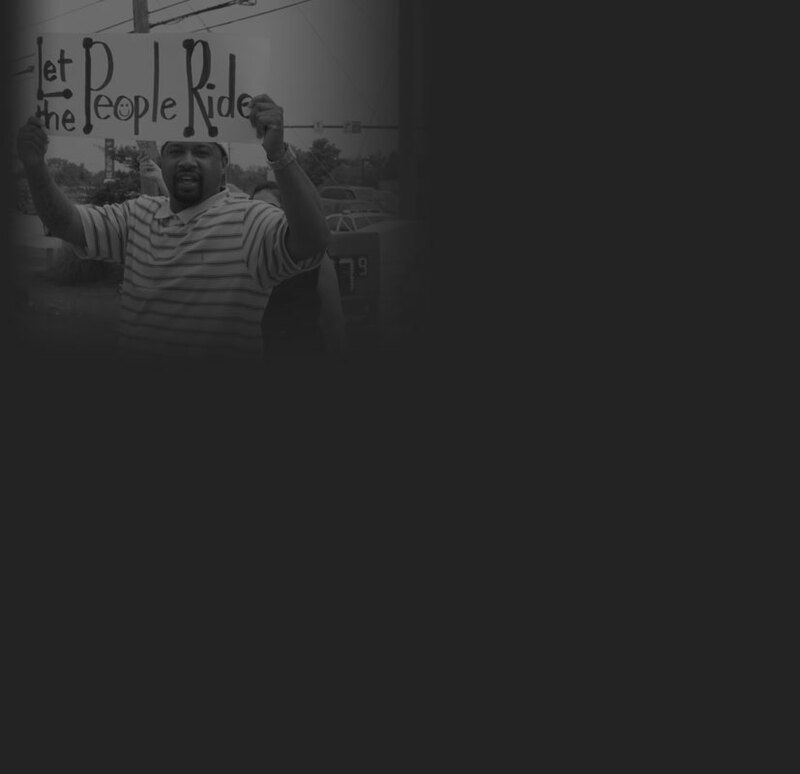 These examples highlight that the Free to Ride story is not an isolated occurrence, but is rather woven within over a century of transportation equity history that has had negative impacts on minorities, especially African Americans. On June 7, 1882 Homer Plessy, a biracial, 30 year old shoemaker, was arrested for violating the Louisiana Separate Car Act. He had bought a first class ticket and sat in a whites-only passenger car on the East Louisiana Railroad, which ran from New Orleans to Covington Louisiana. Before his train ride, Plessy was already an activist for civil rights, serving as vice-president of the Justice, Protective, and Education, and Social Club, which demanded education reform and equality for African Americans. Could states replace the caste system of slavery with a set of legal racial barriers to keep African Americans in a status inferior to whites, despite the constitutional changes after the Civil War that had extended federal protection of basic rights to all citizens? Justice Brown’s court rejected Tourgee’s claims arguing that Plessy was not currently enslaved and that the act in general was not intended to reestablish slavery or create inequities among whites and African Americans. Furthermore Brown stated “if one race is inferior to the other socially, the Constitution of the United States cannot put them in the same plane.” After closing arguments Justice Brown delivered the majority opinion on May 18, 1896, which upheld Louisiana’s decision. Amidst the defeat, political scholar Harvey Fireside makes a good point about Tourgee’s argument. He notes that Tourgee “tried to unmask the Louisiana law as an exercise of ‘white class privilege’, which the legislature disguised by camouflaging its bias, specifically using the ‘unequal, but separate’ seating provisions to give an appearance of ‘impartiality’” (2004, p.194). In Free to Ride Dayton-area resident, Joyce Kasprzak, states that “people don’t understand [that] what they’ve done… is perpetrating the next situation of racism, or classism” (2015). Kasprzak’s comment is a direct parallel to Tourgee’s argument more than a century ago of how seemingly race-neutral language and decisions can have disparate impacts on minorities. The case’s ruling allowed the “separate but equal” framework to shape and become deeply rooted within the next 50 years of American public life and urban development. Rosa Parks became to be known as “the mother of the Civil Rights Movement” for her refusal to give up her seat to a white man, but her activism did not begin on the bus. She had worked as a secretary for the Montgomery NAACP chapter, advocated for the desegregation of schools, and mobilized African American voters. On December 1, 1955 Parks boarded a bus heading home after a long day’s work. 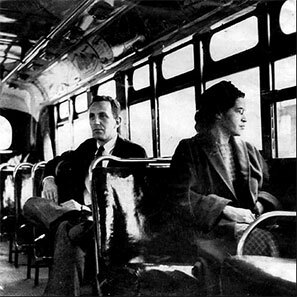 When Parks did not give up her seat to a white man, the bus driver threatened to have her arrested, upon which she said, “You may do that.” Brinkley states “her majestic use of the word ‘may’ rather than ‘can’ put Parks on the high ground, establishing her as a protester, not a victim.” News of her arrest spread like wildfire across the activist community. President of the local NAACP chapter, E.D. Nixon had been waiting for this moment as he was looking for a strong and respected individual that could withstand police backlash and publicity from being at the center of a bus boycott. The boycott of Montgomery’s bus system was orchestrated by E.D. Nixon and the Women’s Political Council. Nixon chose Martin Luther King Jr. to be the face of the boycott as he had the charisma to lead. Tens of thousands of leaflets were made asking African Americans to stay off the bus and when the day came, the streets were filled with African Americans of all ages walking to their destinations. At the end of the day organizers tallied that over 90% of African American riders had not used the bus. That night the Holt Street Baptist Church swelled with people where Martin Luther King Jr. addressed the crowd calling for justice. It was agreed that the boycott would continue until African Americans could ride as equals with whites, which was eventually granted 381 days later in 1956. What arose in Parks that fateful evening was her belief in what Dr. Martin Luther King Jr. often said: that ‘some of us must beat the burden of trying to save the soul of America.’ When a white man tried to use an unfair system to undermine her dignity, Rosa Parks realized that it was her burden to stay put (Brinkley, 2005, p.109). At the same time that bus boycotts were taking place Brown v. Board of Education (1954) was handed down in the U.S. Supreme Court, which overturned the 1896 “separate but equal” ruling. To separate black children from others of similar age and qualifications solely because of their race generates a feeling of inferiority as to their status in the community that may affect their hearts and minds in a way unlikely to ever be undone… We conclude that in the field of public education ‘separate but equal’ has no place. Separate educational facilities are inherently unequal. This ruling set the stage for schools to integrate their classrooms, but integration was often frustratingly slow. Education professor, Peter Moran highlights this point in his study of desegregation in Kansas City. He states that more than nine years after the Brown v. Board decision, Kansas City schools did begin a busing program, but the school system did so by transplanting whole classes from one school to the other. Students remained with the same classmates and teachers, and only mixed with other students at lunch and recess. This example from Kansas City demonstrates how well-intended regulations can still be carried out within a racist framework. A 1971 ruling did, however, build upon the Brown V. Board ruling to integrate students by busing them to other districts. The 1971 Swann v Charlotte Mecklenburg case held the busing be used as a remedy to integrate schools. Political scholar Steven Taylor explains that the case stemmed from the Charlotte-Mecklenburg Public School District’s “freedom of choice” plan where students could transfer to schools outside their zone provided they could obtain their own transportation and that the school had vacant seats. The plaintiffs objected to this plan as it would “place the burden of desegregation on black students.” The Judge in the federal district court case had education professor, Dr. John Finger devise a desegregation plan, in which he included a cross-district busing plan to integrate the schools. Finger’s plan put school systems into districts, pairing African American and white neighborhoods together. African American students would then be bussed to white neighborhoods within their districts. On April 20, 1971 the U.S. Supreme Court upheld the order mandating the implementation of a desegregation plan utilizing busing as a tool of school integration. It was true cross-town busing… there were a lot parents that were worried about their children because we did elementary through high school, going to a completely different part of town. Some of these trips were a half hour away, these were long rides. I think the distance concerned a lot of people. Since the late 1980s, an about-face has occurred within public school integration. In a 2001 newspaper survey in Dayton, Ohio, 53% of African American parents felt that desegregation should end compared to 43% in 1986. Contrary to research findings, African American parents believed that integration did not increase their children’s school achievement and that it only led to white families moving away to suburbs. This switch in opinion came fifteen years after the 1986 the U.S. Supreme Court case Riddick v. School Board of Norfolk, Virginia that granted school districts the authority to dismantle its school integration programs. Since that ruling school districts across the country began ending their desegregation programs, including Dayton in 2002. The switch led to children going back to their neighborhood schools, which were originally planned within intentionally segregated residential patterns. In Dayton, this in turn not only concentrated students racially, but economically as well. What happened in Dayton is not isolated. The U.S. Department of Education released data in 2014 stating that across the country African-American and Latino students in segregated schools are at a great disadvantage. They have the least experienced and qualified teachers, receive the worst course offerings, the worst school facilities, and the least access to AP and upper-level classes. Oftentimes the most segregated African-American schools also have high concentrations of children who grew up in poverty. The crux of this reality is ironically not about desegregation in decades past, but about how racial patterns are still present in schools, with disparate outcomes on pupil performance depending on the student’s school district. Although much progress has been made to seek racial equity, examples from recent decades, like the Beavercreek case, still highlight severe gaps and missteps in achieving transportation equity among minority groups. The following case studies depict how seemingly “race neutral” transportation policies and funding allocations build upon an overtly racialized past negatively affect people of color. Examples of this are taken from Atlanta, the Bay Area, and Buffalo. A positive example from Seattle shows how necessary it is to foster equity and prevent displacement among low-income (and often minority) populations through coordinating affordable housing with transportation planning. Although 75% of MARTA’s riders are African American, MARTA has ironically been accused of not maintaining the same quality of service for its riders in minority communities. In a 2005 article in The Atlanta Journal-Constitution, one MARTA rider exclaimed: “I think the nicer trains are sent to the northern suburbs while the STANKY old 1977 original trains are sent to the Indian Creek station, and all points west of it.” Like in Free to Ride the Metropolitan Atlanta Transportation Equity Coalition (MATEC) filed an administrative complaint in 2000 with the U.S. Department of Transportation (DOT). MATEC charged MARTA with a failure to comply with the Americans with Disabilities Act and violating Title VI of the Civil Rights Act—the same charge brought to Beavercreek in Free to Ride. They claimed that a disproportionate number of MARTA’s overcrowded bus lines were in minority communities and that these communities lacked clean compressed natural gas buses and bus shelters. MATEC reported that disabled riders often faced malfunctioning equipment and endured long delays and trips before reaching their destination. The Bay Area’s transportation system, like in most large metropolitan areas, was laid on existing racialized geography patterns. Like Dayton, Ohio’s west side, African Americans became confined in the East Bay area due to decades of enforced Jim Crow laws, 1950s restrictive housing covenants, mortgage red-lining, and occupancy criteria within public housing that maintained segregation. Race then became not just a demographic category, but acted to mold urban development across the United States. After the streetcar (Key System) was reduced in 1960 and mostly replaced with the AC Transit Bus System, the Metropolitan Transportation Commission (MTC) looked to rail as an effective form of mass transit for people traveling from affluent suburbs to central business districts. As an effect of white flight, the Bay Area had grown tremendously and the new Bay Area Rapid Transit (BART) would serve as a commuter rail system between San Francisco and new outlying suburbs. Construction began in 1964 with service beginning in 1972. With the goals of efficiency and creating convenient commutes for white-collar professionals, BART was not designed to serve the transit needs of minority communities. In 2011 the U.S. Department of Transportation reported that since its opening BART service levels increased, with station expansion and headway reductions, while bus service has plateaued. Funding was disproportionately invested in Bay Area rail. MTC’s 2001 “Regional Transit Expansion Program” allocated 94% of its $13 billion in funds to rail expansion. Projects to expand local (non-commuter) bus services were not eligible for the funding program at all and no funding was given to the Lifeline Transportation Study, which identified service gaps critical to low-income and transit-dependent communities. BARTs funding decisions reflect in ridership statistics. Data from 2000 shows that 21% of whites used the bus system, while BART users were wealthier and 60% White. Furthermore, although West Oakland is 12.5% white, those who boarded BART at the West Oakland station were 40% white. As a result of calculated funding decisions in the Bay Area’s transportation systems by the MTC, residents have been displaced and neighborhoods divided, which reinforces the segregation of the city’s real estate and job markets. Scholars Golub, Marcantonio, and Sanchez summarize that “although the MTC arguably acted with no desire to harm African Americans, it built its rail expansion program on a deeply racialized and segregated map…. under the race-neutral rubric of ‘congestion management.’” As seen in Free to Ride, these local and federal decisions, which seemed independent of race on their surface, soon manifested into barriers to opportunity for minority groups. Mirroring Dayton’s bus line, Buffalo’s number 6 bus line began in a largely working class, African American area and ended in the predominately white suburb of Cheektowaga. A transportation official stated that mall representatives felt that the bus would “not bring in the type of people they want to come to the mall.” During the case’s civil trial, mall representatives claimed that “the mall wanted to avoid… ‘riotous youth’ who use the number 6 [bus]” from congregating at the mall. After seven years of court battles and under threat of a boycott, the Galleria Mall finally permitted the number 6 bus to stop on the mall property. Sometimes we fail to look at what’s the route that people have to take just to get to the bus route. Are there crosswalks? Are there sidewalks? And for so many low-income communities of color, the answer is no. So people are taking their lives in their hands just to be able to get to that bus stop in order to connect to that job or healthcare or childcare or educational opportunity. And as a result, the pedestrian fatality rates are disproportionate for people of color. Although their plans are still in process, results thus far have been positive. In the case of the NewHolly/ Othelle Light Rail Station, which was planned in the late 1990s, over 1,400 mixed income rental and ownership units have been built by the Seattle Housing Authority adjacent to the station. Seattle is becoming a best practice model for equitable transit-oriented development along with other cities such as Denver, Colorado and Portland. These case studies demonstrate how cities also view transit equity under two different lights depending on its historic background and economic context. Some like Seattle, view it as a highly valued amenity, where stress is placed on station access and housing affordability. Other cities like Dayton, stress the access that the system provides to places of employment, health services, etc. Primarily, the focus is to make sure it gets those who are dependent on it where they need to go. As a result cities like Seattle who see transit as an amenity have more robust housing markets, versus the latter, like Dayton, whose markets are more depressed. The historical progression from Plessy v. Ferguson to the Free to Ride story shows that transportation inequities still exist, which translate to employment, health, and neighborhood disparities in minority communities. These historic and contemporary examples show the deep ties between race and transit. Even in a post-Civil Rights country, seemingly neutral decision making when layered upon a segregated geography, produces disparate impacts and reinforces racial barriers to opportunity. Consequentially moving from past decades into the present, transportation equity becomes and still remains a civil rights issue. Armor, D. (1995). Forced Justice School Desegregation and the Law. New York: Oxford University Press. Baugh, J. (2011). The Detroit School Busing Case: Milliken v. Bradley and the Controversy over Desegregation. Lawrence: University Press of Kansas. Brinkley, D. (2000). Rosa Parks. New York: The Pengin Group. Fireside, H. (2004). Separate and Unequal: Homer Plessy and the Supreme Court Decision That Legalized Racism. New York: Carroll and Graf Publishers. Glass, I. (Narrator). (2015, July 31). The Problem We All Live With [broadcast episode]. Ira Glass in collaboration with Chicago Public Media (Producer). This American Life. Chicago, IL: National Public Radio. Hain, E. (1973). Busing, Taxes, and Desegregation (Roger Demont, et. al. Ed.). Detroit: Metropolitan Detroit Bureau of School Studies, Inc.
Kohl, H. (2005). She Would Not be Moved: How we Tell the Story of Rosa Parks and the Montgomery Bus Boycott. New York: The New Press. Marable, M. and L. Mullings. (2000). Let Nobody Turn us Around: Voices of Resistance, Reform, and Renewal and African American Anthology. Lanham: Rowman & Littlefield Publishers, Inc.
Medley, K. (2003). We as Freemen: Plessy v. Ferguson. Gretna: Pelican Publishing Company, Inc.
Moran, P. (2005). Race, law, and the Desegregation of Public Schools. New York: LFB Scholarly Publishing, LLC. PBS and WOSU Public Media. (2010), Jim Crow Laws. [Electronic Source]. Retrieved September 30, 2015 from http://www.pbs.org/wgbh/americanexperience/freedomriders/issues/jim-crow-laws/. Taylor, S. (2004). Creating Constitutional Change. (Edited by Ivers, Gregg and Kevin McGuire Ed.). Charlottesville: University of Virginia Press. Telgen, D. (2005). Defining Moments Brown v. Board of Education. Detroit: Omnigraphics, Inc. The Atlanta Journal-Constitution. (2005, November 13). COMMUTANTS COME HOME: Highs and Lows of MARTA. The Atlanta Journal-Constitution. Pg.3C. Wright, R. (1991). The Birth of the Montgomery Bus Boycott. Southfield. Charro Book Co.
Ziegler, B. (1958), Desegregation and the Supreme Court. Washington, DC: Heath and Co.
What lead Dayton to become a segregated city? How does Dayton’s history compare to other U.S. cities? How does this history compare with your city? Why did busing become necessary to desegregate schools? List some examples from Dayton, Ohio. Why did political representatives believe that racial desegregation was not needed anymore? What ironies has Dayton witnessed since racial desegregation? How has the past repeated itself in Dayton? What examples, past and present, show a connection between transportation and civil rights issues? What benefits and limitations can transportation policy create the in realms of health care, economic opportunity, and affordable housing? What advantages or setbacks have you or people you know experienced due to transportation policy? What suggestions do the authors give to foster transportation equity? How can some of their ideas be applied in your community? What do you believe is the biggest transportation inequity in your city? Why? What historical and policy decisions may have contributed to it? What reforms would you propose to improve the situation? America’s Unfair Rules of the Road: How our Transportation System Discriminates Against the most Vulnerable. Litman, T. Victoria Transport Policy Institute. (2015). Evaluating Transportation Equity: Guidance for Incorporating Distributional Impacts in Transportation Planning. [Electronic version]. Victoria, British Columbia: Retrieved from http://www.vtpi.org/equity.pdf, pg.9. Fireside, H. (2004). Separate and Unequal: Homer Plessy and the Supreme Court Decision That Legalized Racism. New York: Carroll and Graf Publishers. pg. 89. Wilson, Wishon. (2004). Brown v. Board of Education at 50 Reflections on Plessy, Brown, and Our Professional Conscience. [Electronic version]. Young Children, 59(3), 77-79. Retrieved September 16, 2015, from ERIC database http://www.jstor.org.proxy.lib.ohio-state.edu/stable/42729106 . Medley, Keith. (2003). We as Freemen: Plessy v. Ferguson. Gretna: Pelican Publishing Company, Inc.
 Brinkley, D. (2000). Rosa Parks. New York: The Penguin Group. pg.57. Marable, M. and L. Mullings. (2000). Let Nobody Turn us Around: Voices of Resistance, Reform, and Renewal and African American Anthology. Lanham: Rowman & Littlefield Publishers, Inc. pg.376. Wright, R. (1991). The Birth of the Montgomery Bus Boycott. Southfield. Charro Book Co. pg.63. Baugh, J. (2011). The Detroit School Busing Case: Milliken v. Bradley and the Controversy over Desegregation. Lawrence: University Press of Kansas. pg.13. P.L. 347 U.S. 483 (1954) at 494-495 as cited in Armor, D. pg.19. Taylor, S. (2004). Creating Constitutional Change. (Edited by Ivers, Gregg and Kevin McGuire Ed.). Charlottesville: University of Virginia Press. pg.298. Glass, I. (Narrator). (2015, July 31). The Problem We All Live With [broadcast episode]. Ira Glass in collaboration with Chicago Public Media (Producer). This American Life. Chicago, IL: National Public Radio. para. 18 and 19. Golub, A, R. Marcantonio & T. Sanchez. Golub, A, R. Marcantonio & T. Sanchez pg.711. Bay Area Rapid Transit. (2015). A History of BART: The Concept is Born. Retrieved September 14, 2015 from https://www.bart.gov/about/history. Golub, A, R. Marcantonio & T. Sanchez pg.712. Golub, A, R. Marcantonio & T. Sanchez pg.715. Golub, A, R. Marcantonio & T. Sanchez pg.718. Golub, A, R. Marcantonio & T. Sanchez pg.714. Golub, A, R. Marcantonio & T. Sanchez pg.722. Duke, L. (1999, November 15). Buffalo Family Seeking Millions for Fatal Lack of a Bus Stop. [Electronic version]. The Washington Post, p.A03. Retrieved September 16, 2015 from http://www.washingtonpost.com/wp-srv/WPcap/1999-11/15/002r-111599-idx.html. pg.A03. Quamie, L. 2011. Transportation Equity a Key to Winning Full Civil Rights. Reimagine Race Poverty and the Environment. 18(2), 59-60. [Electronic source]. Retrieved from http://reimaginerpe.org/files/18-2.quamie.pdf. pg.60. Centers for Disease Control and Prevention. (2013). Motor Vehicle Traffic-Related Pedestrian Deaths — United States 2001-2010. Mobility and Mortality Weekly Report. 62(15), 277-282. Retrieved September 16, 2015 from http://www.cdc.gov/mmwr/preview/mmwrhtml/mm6215a1.htm. pg.277-282. Puget Sound Regional Council. (1999). Creating Transit Station Communities in the Central Puget Sound Region. Seattle: Puget Sound Regional Council. Retrieved from http://www.psrc.org/assets/3463/_99-09_todreport.pdf?processed=true. pg.7. Growing Transit Communities. (2013). Phase 1 Report: Best practices Research and Assessment of Station Areas. Seattle: Growing Transit Communities. Retrieved from http://www.psrc.org/assets/9341/EastCorridorBestPracticesPhase1.pdf?processed=true. pg.1.